Provides current and historical PUE and DCiE values based on the current IT-load for a fact-based understanding of energy efficiency at the facility level. 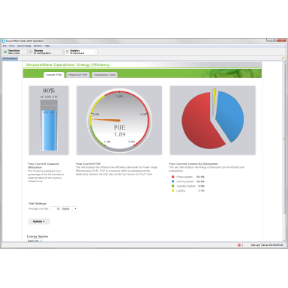 Enables integration with 3rd party enterprise and building management systems, such as TAC by Schneider Electric, for data gathering, customization, and integration of PUE/DCiE calculations. Provides insight into energy losses and cost of energy at subsystem level, providing details of which subsystem draws the most costs. Created for easy integration with 3rd party web page through an open platform.